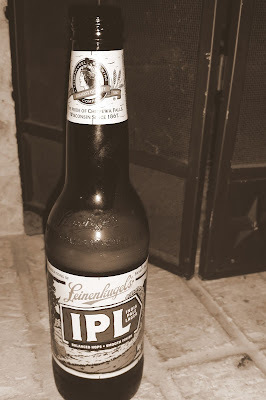 Leinenkugel's India Pale Lager (IPL) - AoM: Beer et al. This beer had a hoppy taste with a good amount of carbonation. However, there was not as much flavor as the average IPA. Everything you love about hops comes through more clearly because IPL® is a lager instead of an ale. We brew ours with five varieties of hops including Mandarina Bavaria from Germany and Citra® from right here in the U.S. We taste citrus, tropical fruit notes and a little spicy pepper followed by a refreshing crisp finish. Give it a try and see what you discover. Pairs with: Wisconsin cheese curds, salmon or trout, and lemon cake.